#fbf to Suga’s Bread Pudding from 100! Suga surely enjoyed her Ash Wednesday treat from 100. The Bread Pudding did not arrive as advertised, with most of the crumble missing from the top, but it was quite warm, soft, delicious and moist, just the way I like it. I give up on trying to find one better than that of Fromage now, as their sweet, nutty crumble on top with caramel and more is unbeatable. However, I definitely endorse the Bread Pudding from 100 and put it 2nd in line. Appreciated the great service from my waitress on the Terrace as well! Turkey Bijou Panini from Fromage! Last Saturday, I needed a quick, light bite that was somewhat healthy because of the Sunday binge ahead at the Restaurant Week launch (Review coming soon folks!). I quickly realised I was due a visit to Fromage Gourmet Market and made my way there a few minutes before 3pm. I received the usual pleasant greeting and good service. I already knew I wanted a Panini, so ordered instantly, choosing the Turkey Panini Bijou over the Smoked Marlin Panini. I was happy to hear I had the option of having my Panini with wheat bread. Fantastic! 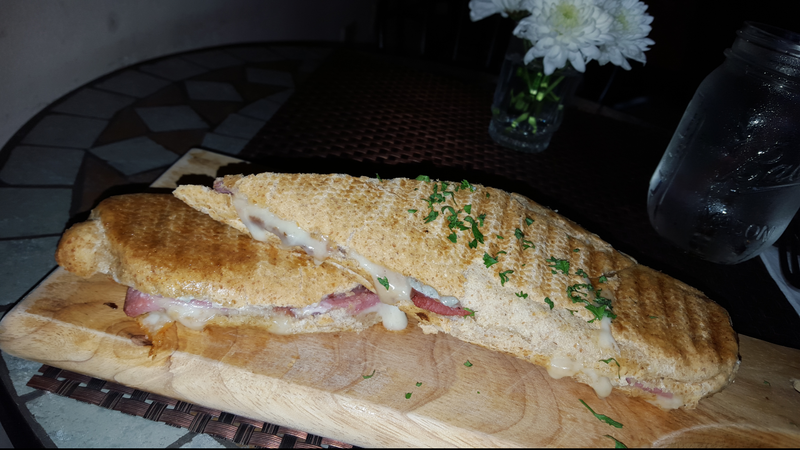 I had to wait 5 minutes more than I would have liked to though, because I do not think a Panini should take more than 15 minutes, but it arrived hot and was quite flavourful with the blue cheese. The mason jars for drinking water or juice and flesh flowers on the table added a refreshing touch. My Panini was also quite affordable and filling, costing $900JMD +tx. Thanks to Pop Up Gourmet Jamaica, I could use my Advantage card there for my 10% discount, so my bill did not go over a $1000JMD. I am delighted that Fromage has maintained a high standard of service and food quality and also revise their menu so patrons never get bored there.